The Hero triumphantly rescued the beautiful princess that was kidnapped by the Demon King. Of course love began to grow between the two people, in front of people who expect this solid principle, the Hero proposed— to the princess’s maid A. “Milady I love you.” “I- I’m just a mob character?!”. Story of maid A who unfortunately got pulled from the role of mob character into a protagonist. This story drags ooooooooooon. FOREVER. There is no real story happening here. Just a lot of thinking by the female main character. Just thinking. And thinking. And some more thinking. Same thing being told in so many different ways. Nothing happens. And you move to next chapter thinking, "oooh! This chapter's name sounds interesting! There must be something here!" But nope. Nothing here, nothing there, nothing anywhere. A big boring novel this one is. The heroine is full of herself. Not in a 'I'm awesome' way, but in a 'I'm not awesome'... more>> way. Still makes you want to rip her face off. "A cute story about 'Maid A' who captured the Hero's attention and become the protagonist." That pretty much sums up the novel so far. I found it to be an enjoyable read, the MC doesn't fall for the ML straight away and questions his attentions (and why on Earth he decided on her.). It's a really simple story and I recommend it to those who want something fairly lighthearted to read. When I read this, it was the Manga adaptation. I wasn't expecting much from reading the synopsis of the manga, but once I gave it a try, I immediately fell in love with it. It was only until today that I found the WN version. Anyway, I digress. 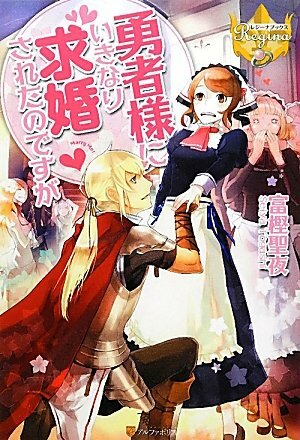 The concept of the story is really interesting and takes on a different route of the "Hero saves the Princess from the Demon Lord, then asks for the Princess' hand in marriage as a reward for saving the Princess" trope. The Hero, instead... more>> of asking to marry the Princess, asks marries the Princess' maid instead (hence "Maid A"). This is... Not cute at all. Hero is a creeper who is trying to manipulate main character into marrying him. Whole thing is a classical definition of getting into manipulative abusive relationship. Including not allowing her to look at other people of opposite gender. Threatening to destroy country. Attaching cursed item that makes forcefully his finance. So read it if you want to know what NOT to do. Trigger warning for people who were in abusive relationships before.